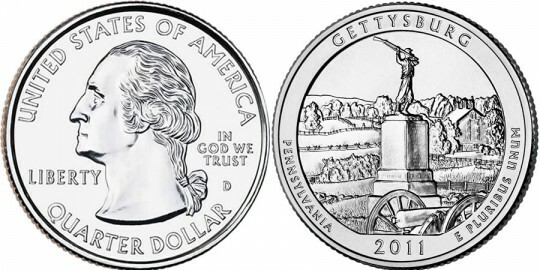 The 2011 Gettysburg National Military Park Quarter will be the first of five 2011 strikes of the US Mint's America the Beautiful Quarters® Program. January 27, 2011 has been scheduled as the release date for the coins when they will enter into circulation and be offered in bags and rolls from the US Mint. These strikes continue the series of coins launched in 2010 to honor selected sites of national interest from around the United States and its territories. The coins contain reverse designs emblematic of the selected sites with five unique locations honored annually until the program is scheduled to be completed in 2021. This strike honors Gettysburg National Military Park which was created by the War Department of the United States in 1895. It was established to commemorate the American Civil War Battle of Gettysburg and those who fought in it. The fighting occurred on July 1–3, 1863 and resulted in the bloodiest battle in the war. Its outcome signaled a turning point of the war which would eventually be won by the Union forces of the United States. John Flanagan designed the original portrait that is featured on the obverse of all of the America the Beautiful coins. Surrounding the portrait are the inscriptions of "UNITED STATES OF AMERICA," "QUARTER DOLLAR," "LIBERTY", "IN GOD WE TRUST" and the mintmark. The reverse of the coin shows the 72nd Pennsylvania Infantry Monument which is located within the national military park. Also included are the inscriptions of "GETTYSBURG," "PENNSYLVANIA," "2011" and "E PLURIBUS UNUM." It was designed by United States Mint Artistic Infusion Program (AIP) Master Designer Joel Iskowitz and sculpted by United States Mint Sculptor-Engraver Phebe Hemphill.